We offer a flexible range of services to suit your aspirations and budget from initial design ideas to detailed garden plans including planting plans. We can oversee the project through to completion and beyond. If you are not sure what you need please call to discuss and we will do our best to help. Design services include concept plans (see example), mood boards, detailed master plans and working drawings. 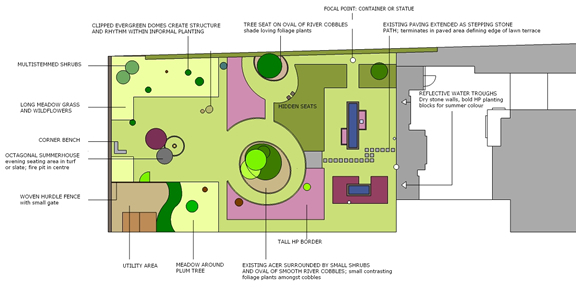 The design work may include 3D computer models or a simple plan view of the proposed garden, depending on budget and the type of garden proposed. 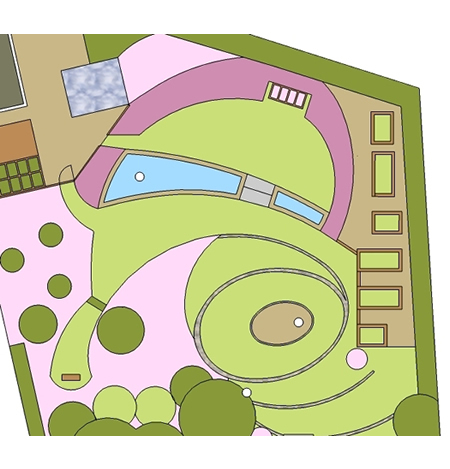 All drawings are based on a survey and site assessment so that the final garden design will really work within the space, taking into account gradients, how the garden fits with the house and all other factors unique to the space. There is a free initial visit at which we can discuss the most appropriate service to meet your requirements and budget. This visit also gives plenty of time to look at pictures of gardens and plants together and for Jayne to get a real feel for the sort of garden that will suit you. Some of our clients may want to take on the landscaping work themselves, working to our plans. If this is your preference we will take this into account from the design stage and will be available to advise or to lend a hand where needed. This option may be most appropriate where the work is mainly digging and planting but we can design to suit your personal and garden needs. 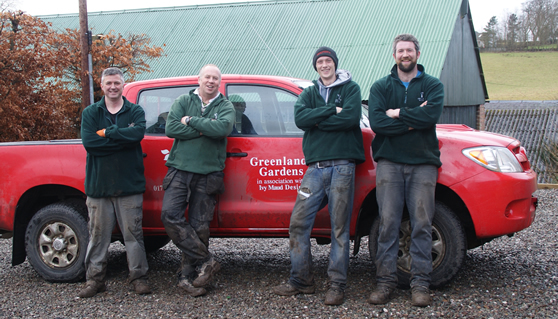 Ivy Maud has a trusted and established relationship with Perthshire landscaping company Greenlands Gardens. Jayne works very closely together with Murray Parsons and his team, making site visits from the very beginning of marking out the design to the completion of bringing your dream garden to life. Having a friendly and professional team of landscapers on site is a positive and enjoyable experience and our clients get a real thrill of excitement and pleasure from seeing their new garden emerge day by day. Our aim is to make sure that you are happy every step of the way. 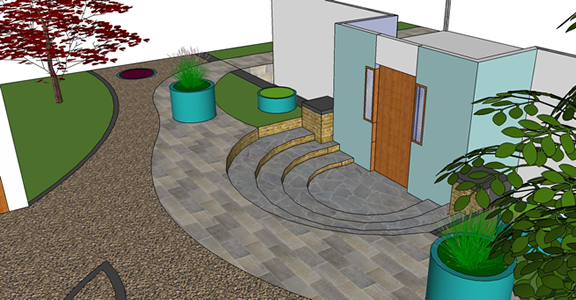 We can provide planting plans as part of the garden design service or for existing borders. Plans will always take into account soil conditions, aspect, local climate, garden style and maintenance levels as well as your personal preferences. The plans will be based on a site visit at which soil samples will be taken for analysis and the site measured and assessed. There will be plenty of opportunity for us to look at pictures of plant combinations and to investigate which colours and planting styles you prefer and to include your favourite plants. Ivy Maud Design can supply all the plants for your new garden. 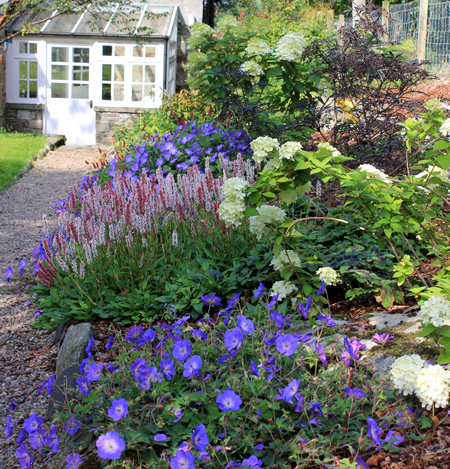 We work with independent Scottish nurseries and specialist growers who grow a fantastic range of hardy plants. We are passionate about Sustainability and Wildlife and so we are careful in our choice of growers and plants. 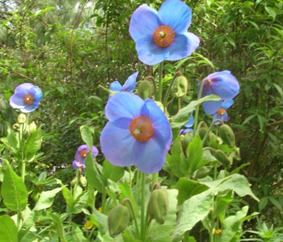 Our designer will check and place each plant for you and we also offer a full planting service. 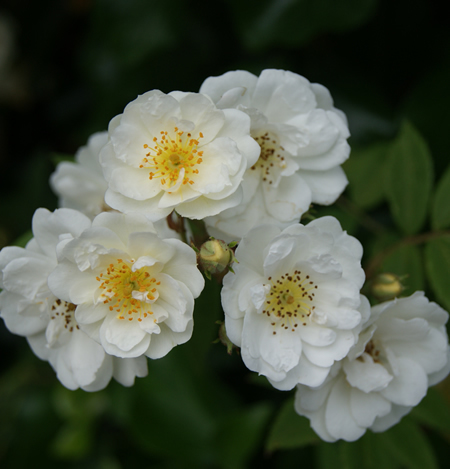 We will ensure you have everything you need from a plant list to full care instructions so you can keep your garden looking good year after year. 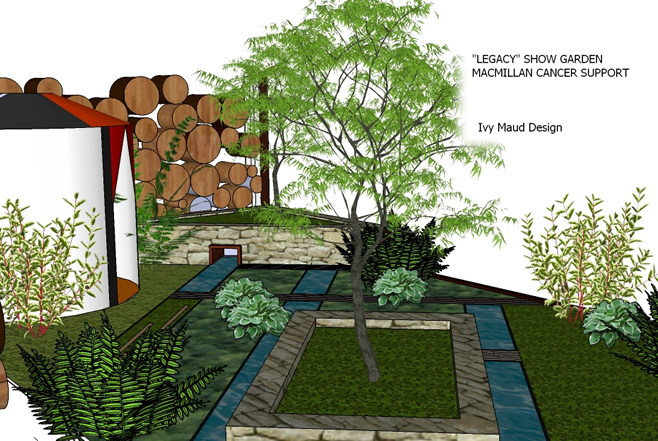 Garden Design clients are welcome to contact us with questions at any time. Garden Design and Build clients are offered a visit and consultation 6 months after completion to ensure all is going well in the garden and to discuss ongoing maintenance. This can be extended to a hands on tutorial session if required. Our partner landscaping team, Greenlands Gardens, offer a grass cutting and garden maintenance service which can be tailored to suit your needs. 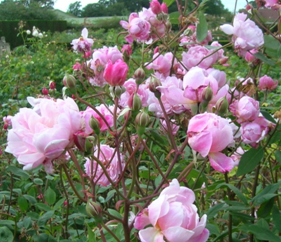 Spikes of pale pink flowers over attractive foliage in late summer and autumn. Attracts lots of butterflies and bees. Delay cutting back until early spring to provide winter wildlife habitat and garden structure. Late flowering tall purple astible. Keep well watered until established. Plant out your box balls and cones as indicated on the design. They don’t like to be too waterlogged so dig a very large planting hole, break up the clay at the bottom and back fill with soil and sand/grit mix as a well as compost or well rotted manure. Intense purple globes look great beside the lime green Alchemilla (they work together as cut flowers too). These are self seeding and spread, enjoy a few extras and pull out the rest. Bowles’Golden sedge. Elegant and tolerant of wet conditions. Trim back dead foliage in late winter before new growth starts. 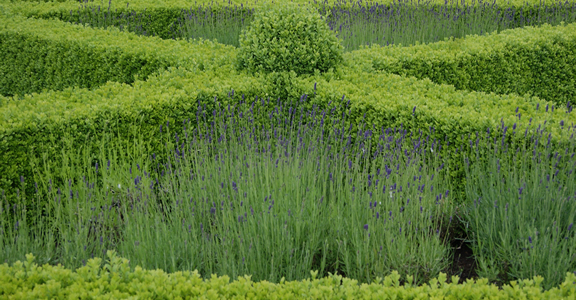 We also offer garden consultancy and tutorials charged at an hourly rate. These can be used to look at problem areas in your garden, get some fresh plant ideas or perhaps a working demonstration of maintenance or pruning techniques. 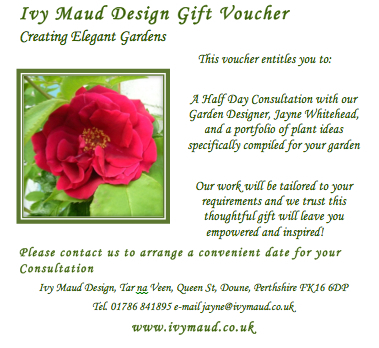 Ivy Maud Design offer fabulous gift vouchers for Half Day Consultations and these make lovely birthday presents, Christmas gifts etc. Prices for Half Day Consultations start at £90 depending on location. Contact us for more details.